Leupold 47638 Mark 4 10x40mm LR/T M3 Tactical Riflescope FREE SHIPPING! Pull the trigger on tough shots with confidence while staring the lens of the Mark 4 10x40mm LR/T M3 Tactical Riflescope from Leupold. Designed for professional and recreational shooters alike, this high-powered optic provides the reliable long-range accuracy you have been looking for. Its multicoat 4 lens system provides enhanced light transference and intensification that results in brighter images in low-light conditions with greater contrast and more distinct colors. Finger adjustable windage and elevation controls make adjusting the sight a breeze, and can even be done with in the field gloved hands. Boasting a waterproof construction and a rugged aircraft aluminum body, the riflescope offers the strength needed to take on the harshest and most extreme environments possible. 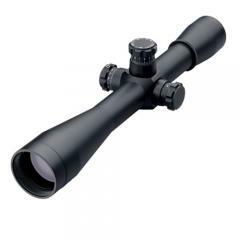 ©2002-2019 CopsPlus.com: Leupold 47638 Mark 4 10x40mm LR/T M3 Tactical Riflescope FREE SHIPPING!